Blueberries belong to the genus Vaccinium and are related to the bilberry, cranberry, huckleberry, hurtleberry, saskatoon, and whortleberry. These round, smooth-skinned, dark blue, sweet and juicy berries with a dusty white bloom, are native to North America and have been cultivated commercially since the early 1900's. The cultivated blueberries are up to four times as large as the wild blueberries and are available from late May to late September. Wild blueberries grow on shrub like bushes in bunches of 3 to 4 berries. They can be found throughout Canada and the United States, wherever there is acid soil and adequate moisture. Cultivated blueberries are mostly grown along the eastern seaboard, westward to Michigan. They are also cultivated in British Columbia and the Pacific Northwest. Most of the blueberries sold in grocery stores are cultivated. 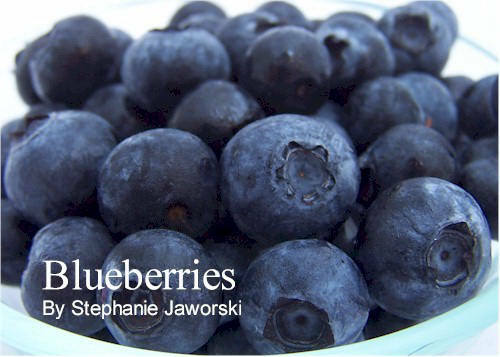 When choosing blueberries look for firm, plump, fragrant, dark blue berries with a dusty white bloom. The white bloom is the blueberry's natural protection against the sun and is a sign of freshness. Always check the underside of the container for any wet spots or staining. Discard any soft, moldy, or crushed berries. Blueberries are excellent eaten out-of-hand or with cream, ice cream, or plain yogurt. Also used in pies, tarts, cakes, muffins, quick breads, pancakes, cobblers, ice creams, and jams and jellies. Frozen and canned blueberries are available year round. They can be stored in the refrigerator for a few days or else frozen. Do not wash until just before serving. - In season from late May to late September. - The Blue Ridge blueberry is thought to be the best tasting. - Wild blueberries were used by the North American Indians. They ate them fresh and also dried them for later use. - The best tasting blueberries have that combination of sweetness and acidity. - There are both low shrub blueberry bushes (about 1 foot tall) and high shrub blueberry bushes (up to 15 feet). - Blueberries that do not have the dusty white bloom on them are old. - The fresh blueberries that are available in the winter can be from places like Chile and even New Zealand.